Home / Uncategorized / How do you find your true passion? How do you find your true passion? From the time I was 7 until I was 18, I wanted to be a professional vocalist. I didn’t even care about the genre- I wanted to sing. I have been classicly trained. I have also taken dance and I’m trained in acting. After I hit 18 (and started smoking), I realized I just wasn’t being realistic. I knew back then I needed to get an education in something practical, but what seems practical also seems like something that would burn me out quickly. When I was a young child I was told I started singing before I even spoke. My whole world revolved around music and basketball. I always had my Walkman in, was in chorus in elementary school and even took vocal classes. I also tried “strings” (violin) but was told I had musical dyslexia (I read the music backwards). I also didn’t get along with my instructor very well. I tried out for all school plays and won one of the lead roles in fourth grade. Unfortunately, I had to share the role with another student and she got the solo I wanted, but I got a duet so I did get to sing. I did all talent shows I had a chance to do and was always singing for family and classmates. I also played the drums in the school band in sixth grade but gave that up as well. I still loved doing it, just wasn’t a fan of the other people in the group. My senior year of high school, I went on stage at the talent show and forgot the words. I literally walked off stage (they thought I was doing a comedy thing and had no idea it was actually the most humiliating moment of my life). After that, I started having problems performing. I would blank when I saw the crowd and quit even singing around other people. At the end of my senior year, my classmates voted me “best entertainer” and “most likely to be a teen idol.” I was also pretty well known, even though I didn’t have many friends. For a good part of my life, I also wanted to work in the fashion industry. I wanted to model but stopped growing and was only 5’5” but was also too fat to be able to get into it. I read a lot of fashion magazines and dreamt about writing for them- I thought being a writer for Vogue would be a dream. I was interested in design but my cousin went into interior design and couldn’t find a job. I thought fashion design seemed like fun as well but can’t draw. I always had in the back of my mind how much I love writing and was constantly praised on it. In high school, I wrote for the paper and everyone who knew me would search out my articles. More than a few said they expected to see my name as one of the writers in the paper. I also wrote for the literary magazine in high school and the newspaper in college. I loved being involved in those publications but I knew, realistically, someone like me would be a longshot and likely fail so I gave those dreams up before I let them play out in my head. One of my favorite pass times as a child (and teen/adult) was walking around on Sundays and walking in open houses. I collected house papers and wanted to work as a real estate agent. I was given a Little Tykes basketball hoop when I was three years old. It moved up to a normal hoop in our driveway as I got older. I played daily at home and would play at church with the middle, high school and college age guys. I hated if they gave me an easy time because I was a younger female. Luckily for me, most didn’t. I got to the point I would shoot one hundred shots a day- and I’d count the number I made so I could figure my accuracy (I got up to a 95-99% accuracy by high school) but I never played at school. I did play for the YMCA for several seasons, I also played soccer, baseball, tee-ball and I dd try out for the tennis team in middle school. I had exercise induced asthma that wasn’t caught, so my teachers always thought I was lazy when I’d quit running laps. For years, I wanted to be the “first woman in the NBA.” When I learned about the WNBA, I watched a bit but slowly lost interest. I never liked playing with other women, it didn’t challenge me as well as I wanted it to and I was afraid of hurting someone. By middle school, when I started meeting women I wasn’t afraid of hurting, I had lost interest in playing on a school team even though a lot of the other parents at my mom and dad’s church thought I’d be capable of getting a scholarship to college. In high school, I took theater and was in the theater program the whole time they had it (unfortunately, it was during my senior year when they started). Once again, I absolutely loved going to the rehearsals, practicing and then performing. I didn’t have a lead role but I really acted out the scenes I did have. Back in high school, I did everything I could to make people laugh- even if it was at me and not with me. When I was in high school, we had to choose majors. I chose business, although I wanted to choose writing. While I was studying the business classes, I loved the idea of working for yourself. I even enjoyed my accounting courses. I got the chance to go to a free enterprise camp where they chose the “most promising” male and female business students. I got a full scholarship to the camp and the teachers pooled together and gave me spending money for the canteen. I fell in love with the camp. At the camp, we were put in small groups and ran through the stages of starting up businesses. I always chose to create the advertisements since at the time I was interested in the marketing aspect of business. I went to college the year I graduated and started my major in communications with an interest in broadcast journalism. The main communications 101 class I took was deliberately held at 8am. It was the only option and we had to have the class to progress in the major. I ended up kicked out for literally leaning my head against the wall (I didn’t fall asleep but was accused of sleeping) so I had to choose a different major. I chose marketing. I ended up dropping after the second semester. I was able to get back in (was booted for a year on academic suspension) and they lifted financial aid suspension. I had everything set up two times to go back. One year I even had my schedule selected but both times financial aid fell through. Both times, I was torn between what I wanted to major in (writing) and what was realistic (something that would guarantee me a job at a hopefully livable income). I was constantly torn. I would decide to go back, then the next week I would already have a different major in my mind. Needless to say, it’s been ten years and I still haven’t gone back. I’m actually no closer to making my mind up since. As a way to gain access to the fashion industry, I did go back to school (beauty school) and studied skin care/cosmetics. I wanted to vecome a make up artist and hopefully get a job behind the scenes one day (in the distant future) during one of the shows during fashion week. Fashion week is a dream for me. Either LA or NYC, I would love to get the opportunity to attend. My dream of being a model ended over a decade ago, close to two, but the dreams I had of either writing for a fashion magazine or working as a designer or artist never fully burned out. I know I’d be miserable as a model, but behind the scenes is a different story. The Devil Wears Prada is still one of my favorite movies and I would love to get my hands on a copy of the season of Running in Heels that made me a huge Marie Claire Magazine fan. Now, I’ve moved on to reading HGTV, parenting and BHG magazine (and similar). I’m more interested in reading lifestyle parenting blogs than I am fashion blogs and I still have several magazine subscriptions. I’m hoping in the near future, I’ll be able to see one of my long time dreams come true. I have a finished rough draft of a fantasy novel. It’s 100 pages and I call it my baby. Thanks to procrastination, I have 3 or 4 short story drafts I’m currently working on. One is 11 pages, will be part of a seven part short story fantasy series, I have 2 rough drafts started for 2 other fantasy novels, 1 sci-fi graphic novel started (but I have no artistic abilities so I’m stuck) and there is a card game I designed to go with that. Confidence is a big issue for me. I am so close to finishing several works, but I’m terrified of failing. I have been doing things I know I’ll be rejected from as a way to get used to rejection (I submitted a tossed together article to a website. I’ve had too many interests. I consider myself a jack of all trades (master of none). I will go through phases where I’m seriously interested in doing things, then I’d lose interest. Then, I would gain the interest again. I call myself a burn out since I’m always burning out. I’ve been working in retail for years, my current job, about 2. It’s my longest job by over a year now. I love my coworkers and I don’t mind what I do, the benefits are pretty good and it’s a reliable pay check but I always wanted to do something both professional and creative. 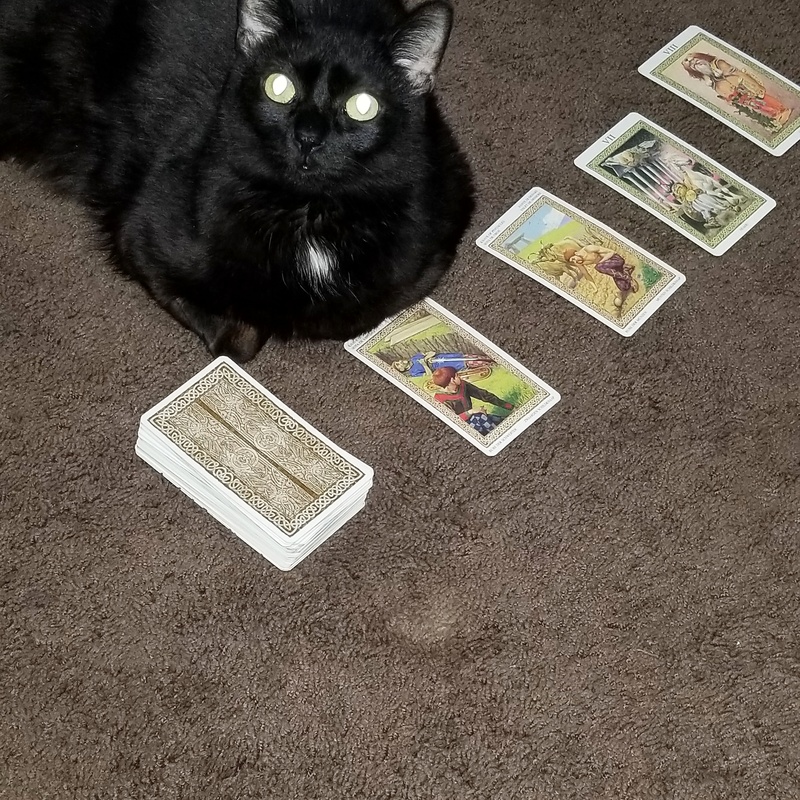 I’m currently selling decorative pillows and I do online tarot reading and dream interpretation on the side. My husband just graduated Friday. He started with an interest in computer repair, started a course then burned out. He later returned to a different school and just graduated the auto tech course. I envy him. He always had those two interests- cars and computers. He didn’t have a long list of things he loved then ruled out although he did start a four year, like I did, but he was studying radio broadcasting then lost interest. I read a lot of blogs, articles and I keep reading to go into something you’re passionate about. How do you find something you’re truly passionate about? Something that won’t fade? I am 30 years old now and no closer to knowing what professional career I want than I was at 18. I have a bunch of things ruled out- but nothing to go on. I have to ask, how do you find that one thing you’re passionate about? Previous post: EDS, post 30 can your body bounce back? Next post: I’ve been dealing with the aftermath of severe trauma for almost 10 years now.